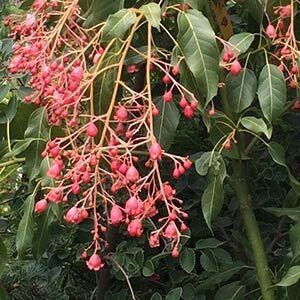 Brachychiton Clarabelle is a flowering evergreen tree growing to 10m. A cross between B.discolour and B. populneus. Large deep pink red flowers with red throats during late spring to summer. Brachychiton Clarabelle makes a great feature tree and a useful shade tree. Although this is a natural hybrid, we suggest looking for the grafted varieties, more reliable in growth habit. They are often grafted onto Brachychiton acerfolius rootstock for vigour in heavier soils as well as to promote earlier flowering. Full sun and a well drained position Brachychiton Clarabelle are generally undemanding and reasonably drought tolerant. Widely used in street plantings many species make great shade trees. Growth Rate – Slow, slightly faster in good soil. Comments – Best specimens are grafted – Frost Tolerant – Attractive Glossy Green Foliage.